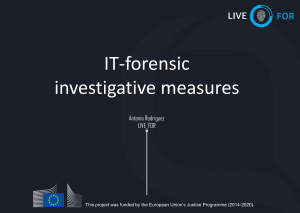 On March 7, 2018 the LIVE_FOR project successfully organized the first webinar on the European investigation order (EIO), e-evidences, and digital forensics. 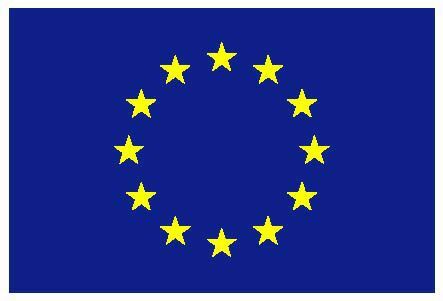 The webinar will be complemented by a face-to-face workshop in Brussels on March 14, 2018. Toma Milieskaite from the European Commission, DG Justice then gave a very interesting presentation on the EIO, including the procedure of issuing, transmission, and recognition of the EIO, as well as the upcoming tools and innovations by the European Commission. 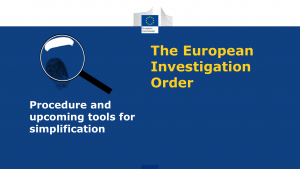 Antonio Rodriguez from Politechnical University of Catalunya (UPC) provided an overview on digital forensics and collecting digital evidence online. He explained how Internet works, how data is stored, and what logs are available. 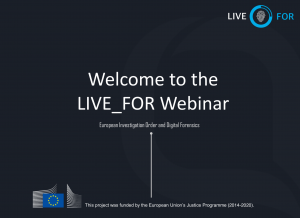 He also showed how digital evidence can be secured, which acquisition methods can be used, and how the evidence can be securely transferred. 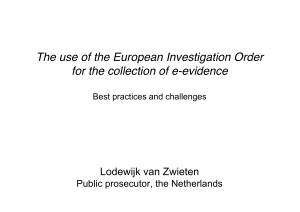 Finally, Lodewijk van Zwieten, Public prosecutor from the Netherlands, presented best practices and challenges in using the EIO for the collection of e-evidence. The slides shown during the webinar can be accessed by clicking on the above pictures.